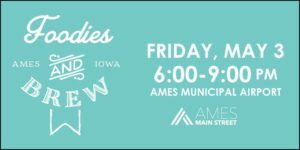 Foodies & Brew is a fundraiser for Ames Main Street to support beautification and growth of the downtown business district. Foodies & Brew is presented by First National Bank. Join us on Friday, May 3 at the Ames Municipal Airport Hangar for Foodies & Brew, presented by First National Bank, – a special evening event that features local cuisine, regional craft beer sampling and live music!